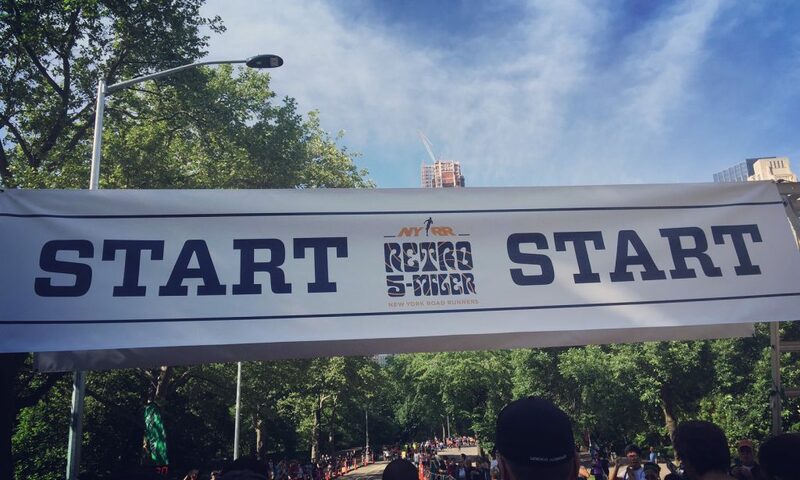 Earlier this week, I completed the NYRR Retro 5-Miler 2017 race on Sunday, June 4th. This was the first race that I ran last year to start my 9+1 journey to qualify for the 2017 TCS New York City Marathon (it was a 4-miler then). You can read my race reflections on it here. In one year, I have experienced more running milestones than I could count. Now that I’ve come full circle with this race and my marathon training, I want to share some of those significant milestones. After college, I took a five-year hiatus from active running. Going on my first run to get back into it was awful. After fifteen minutes, I was completely out of breath and nearly vomited. I seriously doubted my ability to go long distances without stopping. But I kept pushing myself to go farther and longer. When I managed to work my way up to a solid 45 minutes of steady running, I was delighted to hit my first running milestone and gained the confidence that finishing a marathon is possible. Before completing the NYRR Staten Island Half 2016 last October, the only races I’ve ran were 5Ks to 5-milers. I even stayed away from 10Ks because I had no confidence in my training. I must have been out of my mind for suddenly signing up for this half but since New York Road Runners (NYRR) can’t refund me, I was locked into the commitment. On the day of, the weather was absolute crap. I was wet and freezing during the entire thing but I finished with a time of 2:13:39 (@10:12/mile) without walking. Nine races don’t seem like a lot but it is. I’ve had to fight sleepiness, painful injuries and motivational setbacks to get my first ever guaranteed entry to the biggest marathon in the world. Race number nine was the Poland Spring Marathon Kickoff (5M) 2016 in the end of October. I’ve spent more years of my life wanting to run the marathon rather than actually training for it so completing the qualifications felt a bit surreal. I’m ready, though. “I’m marathon training” sounds more badass, anyway. I ran my final qualifier race in October so I could purposefully avoid the winter. But I knew that I would need to face my winter training fears sooner or later. So I decided to challenge it immediately. In the beginning, I hated it. But I learned that for every workout I miss, the weaker I got. This is counterintuitive to why I continue running, which is to be the embodiment of human strength. Regardless of how cold it got, I went out there and ran. Eventually, I learned to love running in the cold. I had no idea that I’d be capable of running a sub-2 half marathon this year. I figured that the 2:05:00 – 2:08:00 range as a target would make sense since I did the Staten Island one in 2:13:39. I absolutely shocked myself, however, when I first broke two hours at the United Airlines NYC Half 2017 in March. My current PR stands at 1:55:24 (@8:49/mile) from the Airbnb Brooklyn Half Marathon 2017. Hitting that sub-2 half marathon time gave me the confidence to call myself a long distance runner. At races, NYRR separates runners into alphabetical corrals based on their average mile pace with the fastest runners at AA going up to L. This is done to allow runners of similar speeds to pace each other. Last year, I started out in the K corral. It’s insane that in one year alone, I managed to bring my mile pace down from 10:08 to 8:19, putting me in the F corral. That’s an improvement of five corrals! By the end of this year, my goal is to break into the 7-minute mile club and get into the D corral. I’m pretty proud of my big thighs. It wasn’t always this way, though and I talk about that here. In the beginning of my marathon journey, I didn’t even have the confidence to wear compression leggings on its own because I was self-conscious of my legs. As a woman with giant quads, I didn’t think I represented the “typical runner.” But if I’m racing sub-2 half marathons and am assigned in the F corral during race starts, I must be doing something right. You better believe that I have a runner’s body. This time around, I qualified for the 2018 NYC Marathon at the Airbnb Brooklyn Half Marathon 2017. In this piece, I shared how qualifying for the second time around was much more fulfilling than the first. While the first time was exciting, the second time felt tougher because many of my personal insecurities surfaced. Most runners know that there are no shortcuts to training. I can’t keep evading those things if I want to get faster and stronger. I had to face them. And face them, I did. Each time I tried to get back into running, I failed. When I started again last year, I was afraid that I’d repeat history and fail. I wrote an email to my coaches about how I’m planning to do the 9+1 process to qualify for the marathon, hoping that this would solidify my commitment to running. It must’ve worked because one year later, I’m still pushing myself and I’m showing drastic improvement. The real victory, however, is recognizing exactly what I need to do to get to where I want to be as a runner. Initially, my goal was to just do the NYC Marathon. But I’m starting to feel like one marathon isn’t enough. I decided to further challenge myself to conquer the world and get my Six Start Finisher status by completing all the World Marathon Majors (New York City, Tokyo, London, Boston, Berlin and Chicago). These are not easy marathons to get into, especially Boston. But if I don’t give myself a big enough dream, I might regret not living life to the fullest. The results of one year of hard work. People often say that running will eventually get easier and I’m not sure I believe that. I’ve been waiting for that to happen but to be honest, this past year was really hard. I had many running breakthroughs, though such as overcoming tough training humps and getting new PRs and I wouldn’t have accomplished anything if “running got easier.” Marathon training itself is difficult but doing so as I experience career uncertainties and other personal issues has been extremely taxing, both physically and mentally. Giving up isn’t an option though so I’m going to continue running and making progress. Don’t go anywhere because I’m committed to this process and I’m going to show you what I got.